Summer sunlight blazes through the cracks between drawn curtains, creating bars of light across my dog as we all huddle inside the shadows to escape the heat. We have no air-conditioning because it’s rarely needed. Today, I can empathize with those hardy pioneers who settled on the prairie and endured summers without modern conveniences. My office upstairs feels like a stuffy attic so I’m writing at my kitchen desk; books scatter across the dining-room table as I try to make sense of recent research. There are cracks in the stories that historians tell about Wild Bill Hickok. Cracks also in my loyalty to kin as I realize I’m becoming enamored with Hickok like some wild-west-junkie. Hickok biographer, Joseph G. Rosa, has both deepened the spell and broken it. Rosa himself fell in love with the idea of Hickok as hero when he watched Gary Cooper portray Hickok in the 1936 movie, The Plainsman. Called “highly fictional,” it nonetheless sent Rosa on a lifelong search for who Hickok really was as a man. Rosa would discover that early Hickok historians were often highly fictional, too. While some based their stories on exaggerated newspaper accounts, including the one that launched the whole “M’Kandlas Gang” myth into existence, others nagged the Hickok family for facts, or made up their own. One even harassed a 93-year-old Sarah Shull until she confessed to historian, F. J. Wilstach, that David Colbert McCanles was a “horse-thief for the Confederacy.” Even Rosa says that Sarah most likely told Wilstach what he wanted to hear so he’d leave her in peace. Historian, Mark Dugan, goes deeper to surmise that Sarah would rather confess McCanles as a horse-thief than as her lover. That Sarah was Cob’s lover is documented by my 4th-great grandfather, James McCanles who was Cob’s father. Sarah had a baby out of wedlock in 1856. A year later, the baby died but was memorialized in a poem that James wrote to his granddaughter. That shows the McCanles family accepted the girl as one of their own. Also, it is documented that Sarah’s father refused to grind corn for James after 1856, and it’s known locally that he shunned his own daughter. He did not accept the baby born out of wedlock and held the McCanles family accountable. “Cob” was a familial nickname, probably derived from David’s middle name Colbert, phonetically making the “l” in “Colb” silent. In recognizing the phonetics, you can almost hear the deep southern drawl in how the name was pronounced, “Cawb.” It’s important to remember that his name was perceived as southern as we consider the misconception of historians, including Rosa, that because Cob was southern, he was a Confederate sympathizer. Absolutely not. I’ve extensively researched the duality of Civil War sides in my North Carolina kin, having ancestors that fought brother-against-brother. I have records that show the dividing lines, and the McCanles men were Unionists. Where historians make their assumption is in the bloody scrimmages that marked the Kansas-Missouri territory as “bleeding Kansas.” Here, staunch abolitionists went toe-to-toe with diehard slavers over the issue of slave-states as America expanded west. The Hickok family came from Illinois and were abolitionists, even participating in the underground railroad. Thus, historians pit McCanles against Hickok as part of the border ruffian battles. While Cob wasn’t necessarily for or against slavery, he was staunchly opposed to succession. Ultimately, both men were pro-union but for different reasons. So nix the idea that Cob was doing anything on behalf of the Confederacy. But what was he doing out west? Several historians in the 1920s dug up information that Cob had made off with tax-payer money as sheriff of Watauga County, NC. Court records substantiate this claim, although most historians, Rosa included, rely on the hearsay accounts of historian, J. P. Arthur. And here’s another crack: if Arthur is correct, and court documents do show multiple parties involved in a scheme, then Cob was not the only one who benefited. Consider this–your buddy says, “Hey, I know how we can scam the system.” If the scam includes only your buddy getting money with your help, you’d probably pass. But if the scam means that you get money too, then you’d be more likely to get involved. So, to say that Cob was helped by his brother Leroy, the deputy and his kin, the Coffey kin and several others, you have to wonder what was in it for them. Cob might have left North Carolina with his pockets lined, but who else lined their pockets, too? If Cob didn’t go wayward until 1855 when he met Sarah, who was 21 and working in her father’s store, is it possible that she–as an experienced accountant–came up with the scheme to defraud tax-payer money. Her motive? To leave town where she had been shunned, buried a baby and master-minded a fraud to fund her new life out west. Because after the money changed hands, that’s exactly what she and Cob did. They left. Other cracks that seem minor, discrepancies such as whether or not Sarah left after Cob’s death, or how Hickok was injured before coming to Rock Creek are difficult to prove or disprove. So many historians rely on the accounts of others. Rosa discredits earlier Hickok biographers but then relies on their same work to show McCanles as a sadist horse-thieving Confederate bully. Rosa fully cites from Hickok’s great-nephew, but sneers at Cob’s son who shares his eye-witness account of the Rock Creek incident because it was published 50 years later. My conclusion: historians are all cracked. While I hope to one day write a fictional account of Sarah, Cob and Hickok as a BOTS (based on a true story) it’s hard to sift out what is true. That I fell for the legend that is Hickok is partly because of letters Rosa published from him as a young man, first arrived in Kansas Territory. So full of enthusiasm, humor and adventure it’s hard not to love the boy he must have been. I hope to find that in Cob, too and certainly I feel sad for Sarah who lived long knowing the real reasons for what happened that hot summer day on the prairie in 1861. If you haven’t already guessed, I’m exploring cracks. We crack-up at jokes; we call the mentally-crazed “cracked”; we know it as slang for cocaine, a sharp retort, a split, a change in voice. There are cracks in times, cracks on her face, and worrisome cracks across thin-ice. What a wonderfully rich word is found in crack. July 30, 2014 prompt: In 99 words (no more, no less) write a story that involves a crack. It’s a rich word, full of possibility. Do cracks reveal something to you, something beyond the surface? Take a crack at this prompt and respond by noon (PST) Tuesday, August 5 to be included in the compilation. 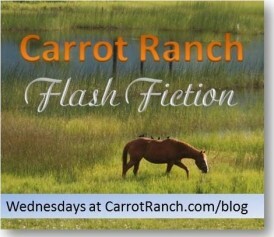 By Charli Mills in Flash Fiction Challenge on July 31, 2014 . Kept us in suspense staring at the unknown crack. Laughed when realised what crack she was looking at. It took me a minute…but when it hit I snort-laughed! So subtle but when the image materializes, I want to look away, but you made me look! Great flash of crack! Okay…off to read more! Oh no! Do my eyes deceive me? I shouldn’t be laughing but this is great, Pete. Love the description of the clerk. So well done. Oh, busted indeed! Love the interaction as the clerk struggles to remain professional. It really shows us how the BMW owner is struggling to maintain the image of his car represents. Great flash! I can just see the BMW owner and the mechanic. I should feel sorry for Pete but I think he may have got his just desserts. I’d like the gossipy background story. Reminds me a little of a certain golfer’s tale. Thanks all, I’ve enjoyed reading all of the different takes! Powerful and poignant. Says so much about beauty and jealousy. What I find interesting, and poignantly human, is that ultimately the narrator wants to see her flawed true beauty not the perfect skin. Beautiful flash! Great flash Sarah. Like Pete, I can see the girl before and the girl after and you have also shown the inner and the outer beauty. Sad. Lovely that you can see beneath the skin to the beauty within. Interesting that it may have been more difficult to see before. Took me an age to get to this, but glad I did. It reminded me of a horrid case of an acid attack here, where an ex boyfriend had Katie Piper attacked.and scarred her and despite the disfigurement she is trying to be open to help others. http://en.wikipedia.org/wiki/Katie_Piper. Very powerful; very poignant. Talk about finding light in the cracks…what an unbelievably horrific attack to overcome, yet it seems she has created powerful messages from her experience. Charli I loved the history and the cracks that you have found in the currently accepted story of Hickok, Cob and Sarah. It must be difficult researching a time where there are few documents when most of the historical account has interpreted what there is in one, possibly erroneous way. I’m looking forward to your BOT. I think if one hopes to fill in the cracks, one can only do it with imagination. Hickok’s letters make him seem more real, less myth, but really do nothing more than to establish where he was at a certain point in history. To me, the most “damning” evidence that Cob indeed left NC with Sarah (and not his wife) is that they are both in the same household in the 1860 territorial census. But that doesn’t tell us why. Or why his wife joined them! And the poem I reference isn’t a DNA test to prove Cob the father of Sarah’s child, but it certainly reveals that Cob’s family thought she was. Again–why? There is nothing in the documentation of North Carolina to show Cob as a bully or philanderer. Those who claim he was sadistic have nothing to substantiate the claims and were told by men who Rosa discredits as making up stories. Yet historians continue to accept those stories of Cob. He was a Republican-Whig, thus he sided against succession. But he was southern by culture and region. What was it like to be in a divisive territory as a Unionist, but not accepted socially by the radical abolitionist population and be at odds with other southerners? I’m thinking of creating a spreadsheet that shows established facts, assumptions, disputed tales, accepted tales and the cracks in between. My BOTS will rise from the cracks, but be built a top an accepted foundation. Yet, I have no idea what I’m going to do ultimately–heck, I was just exploring the story in flash fiction! Something exploded. 🙂 Thanks for responding to the research–any insights along the way are greatly appreciated! I think a spreadsheet is a great idea. It would be interesting to see it laid out like that with the overlaps and the cracks. Such a famous person (we even know wild bill hickok in Aus) there must be oodles of research done on him and as the McCanless killing was reportedly his first of many I bet Cob gets a bit of a look in also. I’m sure you have been checking all resources but have you looked at phds done on the subject.I just did a quick search and didn’t come up with any pHDs but 5 pages of articles most of which would be available to you.Rosa certainly seems to be the authority but Wild West journal and the South Dakota magazine are quite prominent also. What wonderful relatives to research. I hadn’t thought of that, Irene! Thanks for looking at possible pHDs. Wild West Magazine and South Dakota Magazine would be great resources, too. I know a professor of history who teaches in Boone, NC and I’ve read his books on the Civil War in that region. He might know of other sources on Cob. I have the book that Dugan included unpublished research on Sarah Shull. Most historians (Rosa included) gloss over where she went next. Most claim she took a stage out of Rock Creek the next day. Yet, Dugan argues that Leroy McCanless paid her claim that Cob owed her money for her accounting services a month later which implies she stayed at least that long. Leroy may have taken her to his ranch after the burials. I think that spreadsheet will help! Thanks for your tips! Charli – If you haven’t already done so you might want to search the online database at the Library of Congress for documents, stories, research etc regarding Hickok and McCanles. Brilliant idea! Oh, my goodness it’s such a rich resource and I didn’t think of it. Just a quick search revealed an early type-written account of the “McCanless Hickok Affair” from a witness I hadn’t heard of before! Also found a collection of 1930s songs sung by one of the Coffey kin from Shulls Mill who would have known Sarah! Gave me chills just thinking about it! Thanks, Larry! I agree with Irene. I am loving reading more about this story – particularly because of your family connection – makes it more real somehow. Although, as a descendant you could have a particular interest in telling the story of your family in a positive light, you appear to be more keen on finding out the ‘truth’ on which to base your book. I find this admirable. Truth is not always pretty or how we wish our ancestors behaved, but truth makes for the most powerful story. I might have a few disgruntled cousins, but I think they would rather have a truthful story, too. That’s possibly true. I’m thinking of that in relation to my family’s story. There is a lot there that none of us want to talk about! Aw, my heart breaks reading this. Like falling into a crack. One thing I like about the 99 word constraint is the power it gives to even the littlest of words. The “a” in “a school parking lot” says volumes in the imagination. Is she a teacher? Is he a professor? Do they have children? Did she go back to school? It doesn’t matter except we feel as though this place is suddenly reduced to “the” place the crack becomes exposed. What is painful about her reflection is that she never saw it coming until it swallowed her up. Great flash! Isn’t it amazing that the most insignificant of locations can take on a new significance for the actions taking place there. This school parking lot will forever be in Sophie’s memories, and one she would probably rather erase. Ouch. Beautifully done. Love the title, too. There’s something about the combination of children and evil that seems so sinister. It indeed cast a creepy shadow to to cracks! I love your post. It is so full of information. The story, and your story of finding it, is fascinating and I am very much enjoying following it. I like your flash with the crack in the curtain letting in the light, but the curtain hiding something from view too. There’s a lot of suspense, and subtlety here also. I’m working on my piece but haven’t quite filled in all the cracks yet. That will be done soon! Thanks for saying so, Norah! I’ll have to build up confidence for a BOTS but I have such wonderful, knowledgeable connections that I think I can eventually accomplish historical fiction, longer than shorts. Or maybe I take a stab at novellas. Just not sure where potential markets or readership are for westerns these days. But it’s good to have possibilities open. If I were to apply this project to the “W” I think I would start with this scene–the actual shot fired. Anne wrote a post and started a discussion on where to start and how much to reveal. Since it’s already established that Hickok shot Cob, I think it could be an interesting beginning with forward and reverse story lines from Sarah’s perspective. Thanks for commenting as it helps me explore! It’s interesting that you say westerns don’t attract much of a readership these days. The story is perfect for transposing to a modern setting. I think the shot is a good place to start. I do like the technique of moving back and forth through a story, as long as the timing is clear. I think the story from Sarah’s perspective is going to be the interesting one. Seems she may have had more involvement than just looking on! What a cracking flash! Oh, crab legs sound soooo good, yes, the butter! But alas, cracking the legs is a fumbling frustration for me. Awesome flash from your leggy perspective! Another cracking post, Charli, and some great responses. You’ve got me thinking that it’s in the cracks that I’m looking for my fiction, both as a reader and writer. I’m reflecting on this in my post today along with my own stab at crack fiction … And a song (not mine, I hasten to add) with a great line on that same theme. Thanks for the inspiration. I think there’s validity to that Anne–finding the story in the cracks. Great stab, song and review! Oh, you’re cracking me up! Glad you resisted the urge–follow it while it still feels energetic! Adding humor in 99 words is tough…Good job! Ack! I must not have refreshed the page. Didn’t see your comment but (see below) completely agree. Thank you, Lori! There’s so much material in history, even in our own trees. I hope our future generations will know we did our best and lived out loud! I love reading your intros before the prompt. I’m completely hooked now. You’ve written your passion for these historical figures so well that I think you have everyone here hooked on them. I’m looking forward to reading your version of what happened with these three. And another great flash. This story is so rich…so many layers. I thought so, too–crack is full of possibilities to play with! Glad you cracked this one! And I always appreciate the post it’s in and marveling at how you tie it back to education. It’s like a double prompt! A well inspired flash! Good job to make such quick work of the inspiration, too! Thanks for joining us in taking a crack at the prompt. You can write the range with us any time. Feel free to come and go as you wrangle words (and kiddos)! New prompt every Wednesday and compilation posted on Tuesdays.